Up until very recently I had only intended to build and play with 20mm (1/72nd) scale models in my BattleGroup games, BUT then I got hooked on 10mm as well.. The 10mm scale offers the chance of putting a lot more toys on the battlefield as well as allowing a greater range of ‘clever’ manoeuvres like encircling or outflanking (at least if you can manage to conceal your real plan before your opponent sees it), whilst also allowing the greater range of the German guns to be felt (20mm playing areas normally don’t allow this important difference to be noticed, things being so close to start with). Also, by enabling a much bigger scale of operation to be laid out, you can really start to see a replica of the battlefields you have seen on the historical TV programmes like World at War. With all this in mind we set out to play a BattleGroup Kursk game based on pg 176 in the book, the Strongpoint Assault. This was basically the Germans trying to take a number of Russian strongpoints, one of them being a Bunker (which is hard to damage in BG rules). The game was played on a 9 * 6 ft board, some buildings and scenery being used, but no t much as the battles around Kursk were mostly fought in open country. BattleGroup uses a points system, this allowing each player to choose which units they want to have in their ‘army’, whilst at the time giving some balance to both sides AND most importantly causing the armies to look like the real thing in the machines and men used. More action around the woods in Mini Staliingrad attack. It was a big game, perhaps on hindsight too big, over 2,500 points being used up (to give you an idea, a normal 20mm game will have between 400 and 600). In this scenario, the Germans started on the board, with the Russian having only 50% of their forces on the board to start, the rest ‘feeding in’ over the course of the game, but only after a few turns had been had. This delay should have been enough for the Germans (me) to make a good dash across the board, BUT the Russians had decided to blunt and slow down the attack using some T34 and T70 tanks, these managing to slow the advance right down. Besides these tanks, two groups of infantry armed with AT grenades and ‘Mine dogs’ lurked in some buildings just inside the Russian set up area. This and some poor German planning meant that not enough ground was taken quickly enough. To make things worse for the Germans, their flanking force arrived early and quickly the area around them became a sort of mini Stalingrad, more and more German forces being sucked into take a small village, whilst all the time the Russian’s tank reinforcements were also arriving. In the end the Germans did win on a points basis (there are no draws in Battlegroup) but they had not played well and so in my view it was a draw, the Russian tactics (and bravery) being so very good. The game was in all played for about 6 hrs, but at the end of it we were all a bit ‘battle happy’ and think that next time, we should keep it to just 4 (or 5 as a max), hopefully, at times being able to leave the game up and play it though at a later date. All in all though, another really great day! 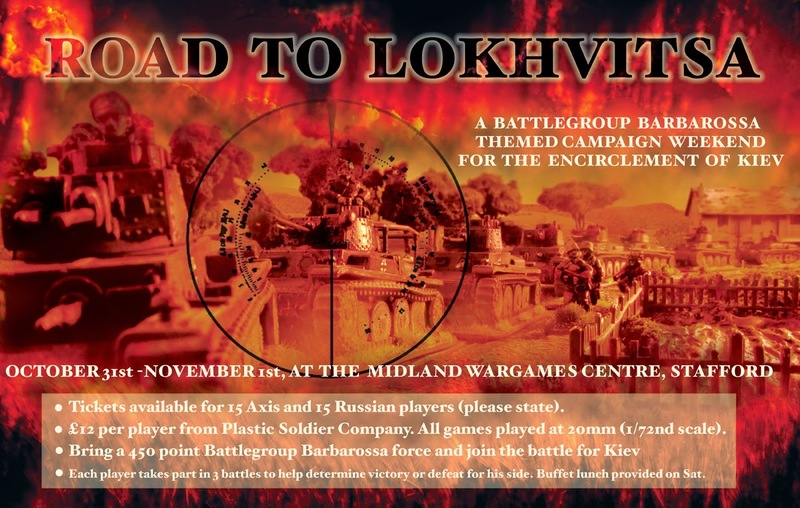 I played in the last ‘BattleGroup’ weekend in 2014, that one covered Kursk and the German’s got creamed, just like the real thing.. The next game covers the Barbarossa campaign, which will be very different indeed. i have already bought my German ticket. Came across this and thought it might be worth sharing. For my part, I don’t think you can beat the Battlegroup series of games. Sure you can say that they could be even better with a tweak or two (although many disagree with this), but overall, they get 10/10 from me! I reckon that wargaming is as much an addiction as a hobby (not that I am complaining) and with this in mind I must report that the latest model that ‘I just had to buy’ was the Revell LSV. It’s 144th scale, (which I reckon is about equiv to being 12mm) so it won’t look out of place (well not too much) with my 10mm models (some of which it could be augued be 9mm, and 12mm…). Landing Ships of the LSM-Class (Landing Ship Medium) were used from the middle of 1944 by the U.S. Navy in the fight against Japan in the Pacific. Totalling more than 550 ships they were the main component of the amphibious forces for landing troops and vehicles on enemy beaches. The loading capacity of a LSM roughly corresponded to a mechanized platoon. The steel hull had nine watertight bulkheads. With an anchor located at the stern, the ships could withdraw from the beach without assistance. Armour plating protected the superstructures against small arms fire. The early LSM were mostly equipped with six 20-mm Oerlikon guns for self defence. The open-top cargo area encompassed almost the entire length of the ship and was at maximum 7.9 m (26 ft) wide. By the end of the war, nine ships were lost mainly due to kamikaze attacks. After the end of World War 2 some ships went into service with allies armed forces. In 1958 NATO partners Germany received three LSM and two LSM(R).